APJ Abdul Kalam was a great scientist and he was also the 11th President of India. We have provided different essay on APJ Abdul Kalam, it is a very common topic which your kid may get in his/her school essay competition. Students can select any of the essays given below according to their need. After India got Independence many Presidents came on the seat and Dr. A.P.J. Abdul Kalam was one of them. He was the 11th president of India. His full name was Dr. Abul Pakir Jainulabdeen Abdul Kalam. He was born on October 15th 1931 in Rameshwaram, Tamil Nadu. He was born in a poor family, his father was a boat owner. But he was exceptionally a brilliant child. He became the first graduated in his whole large family. He has done his graduation in BSc. from Saint Joseph College of Tiruchirapalli. Later he joined Madras Institute of Technology and his whole life got change. He had a dream of going abroad, but he wanted to serve his motherland first. Before appointed a president of India, he also visited abroad once. That was his visit to NASA in the USA. After that he joint Defence Research and Development Organization (DRDO) in 1958 later he joined the Indian Space Research Organization. He had also got the title of ‘Missile Man of India’. It’s because of his various hard works on missiles like Prithvi, Agni, Akash, Trishul. He was fond of music and reading the holy Koran and the Gita. After becoming the president he was very much interacted with children. He visited many schools and taught children good lessons. He was really a great person and a perfect president. The great personalities like Dr. A.P.J. Abdul Kalam had a large contribution in making India a developed country. Dr. Avul Pakir Jainulabdeen Abdul Kalam was born in a very poor family on 15 October, 1931 in Rameshwaram. His father Jainulabdeen was a boat owner and mother was a housewife. Though he was a legatee of adversity and poverty yet he was not born to shatter. With his brilliance and intelligence he attained a degree in BSc. from St. Joseph College of Trichurapalli. Thereafter he got a diploma in Aeronautical Engineering from Madras Institute of Technology. In 1958 after obtaining his diploma in Aeronautical Engineering, he appointed as an assistant to senior scientists in Defence Research and Development Organization. At the beginning of his career he was appointed as the chief group of development of hovercraft plane. He got transferred to Vikram Sarabhai Space Research Programme (SLVP) in 1963 and he worked there till 1980. During this time, India achieved a big milestone in the world of space science. Prime Minister of India, Indira Gandhi recognizes the worth of his brilliance and appointed him as the Director of Integrated Guided Missiles Development Programme. This was the beginning of his missile carrier. He is responsible for development of missile’s including Prithivi, Agni, Akash, Trishul and Nag. He is also instrumental in developing the cryogenic engine in our country. He is presently known as the father of the Indian Missile Programme. For his excellence and brilliance, he got honoured with the prestigious Bharat Ratna award in 1998, Padma Vibhushan award in 1990 and Padma Bhushan award in 1981. Many universities have given him the honorary degree of Doctorate. Just before appointed as the Eleventh President of India, He was a professor in Anna University. He is the second president who had no connection with politics but he did his duty with great responsibility and made India a developed nation. He is truly an inspiration for all. The Journey of Dr. APJ Abdul Kalam from his home in Rameswaram to the Rashtrapati Bhawan in Delhi is full of honours. His real name was Avul Pakir Jainulabdeen Abdul Kalam. 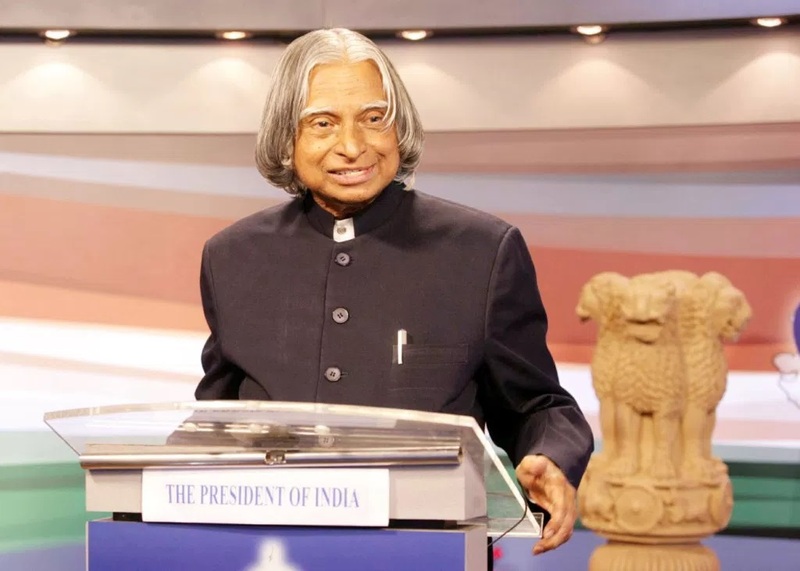 His father was a boat man and he was a newspaper hawker himself in his childhood who read the news first before selling the papers as he believed that one day people will buy the news papers to read his achievements as a great scientist and a President of India said Abdul Kalam. He was born on 15th October 1931 in a Tamil Muslim family. His birthplace was Rameshwaram in Ramnad district of Madras. He got average grades in school though he was highly appreciated for his will to study. He has done his schooling from Schwartz higher secondary school in Ramanathapuram. Later he did graduation in BSc. from Saint Joseph College in Tiruchirappalli, Tamil Nadu. He had his major in Physics. Later his sister had give up her jewellery to send him Chennai to study aerospace engineering in Madras Institute of Technology. In his childhood he had a dream of becoming a fighter pilot but he missed the chance but he didn’t break down. As a scientist his contributions to the nation are immense. He was responsible for the development of India’s first satellite launch vehicle, the SLV- 3, development and operation of strategic missiles. He got appointed as the chairman of Technology Information, Forecasting and Assessment council (TIFAC). He guided many technology projects and missions to bring India into the 21st century. In 2002 APJ Abdul Kalam got appointed as the Eleventh president of India and stayed in this post for 5 years. After that he returned to his civilian life of education, writing and public service. 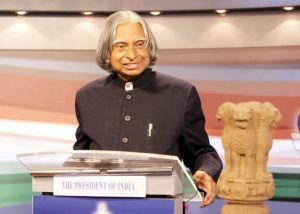 Abdul Kalam hold various post under DRDO and ISRO and later become Principal Scientific Adviser to the Government of India as well as holding the post of a Cabinet Minister. For his great achievements he got honoured with Padma Bhushan award in 1981, Padma Vibhushan award in 1990 and Bharat Ratna award in 1997. It is believed that a president should be a great leader. It signify that they should have an ideal character. He/she has the capability to lead others. A leader’s responsibility is too acknowledged to live their life with sincerity. Dr. APJ Abdul Kalam is the one who influenced us deeply. This great personality had his last breath on 27th July 2015 while delivering a lecture at IIM, institute Meghalaya. He had collapsed due to a sudden cardiac arrest and he died on the spot. Whole country was in shock and agonized the death of him. He is not present physically but his great work and achievements will always be remembered by every Indian. And all we have to do is to give our part as a new generation kid in making India a developed country. This is what he wrote in his book “India 2020- A vision for the New Millennium“.